I gotta admit, I do love a retro salad. Crab Louie, Ham Salad, and perhaps my all-time favorite in this classic category: The Waldorf. Apples, grapes, walnuts, raisins, celery (not a fan but it’s got to be there!) all combined in a tangy mayonnaise-based dressing. Seriously, what’s not to love?? Well, for starters the calories. Yes, you’re getting all sorts of healthy things in there but usually the dressing is so thick that it overwhelms everything and wilts the bed of salad greens the whole thing is served on. What about lightening up the dressing, and rather than putting it on lettuce, build some whole-grain goodness into the mix as well? Now, we’re talking! That’s exactly what attracted me to Food Network Magazine‘s Farro Waldorf Salad. I took the revamp a step further and swapped out the sour cream for plain yogurt in the dressing. I also found that I only needed about 1/2 the amount of dressing called for. Don’t use it all at first — start with half and work from there. This should be the new standard for Waldorf Salad….and it definitely will be the only version served around here! Cook the farro as the label directs, then spread on a baking sheet and let cool. Weekly Winner: Whatever You Call It – It’s Tasty! What constitutes a salad? I know there are “entrée” salads and “side” salads and “grain” salads. But what, exactly makes said dish a “salad”? These are the deep thoughts and nagging questions that keep me up at night. (OK, actually nothing keeps me up at night – I sleep like the dead. But it makes for a good post so just go with it.). The dictionary tells me that it has to be a cold dish to be a salad, but if that’s the case, what about warm potato salad? Is it the dressing that makes a plate or bowl of ingredients into a salad? I honestly don’t know. And you know what? I don’t care, either. When I can compose a dish this drop-dead gorgeous, interesting, and healthy and…. oh yeah, crazy delicious… then you can call it whatever you want. According to Cooking Light Magazine, this is Chicken with Broccolini and Farro-Beet Salad. According to me, however, it was a spectacular dinner. I did make just a couple changes to the recipe. First of all I had regular broccoli on hand rather than Broccolini so I used that. Secondly, I did not buy raw beets and microwave them — I bought already cooked beets and used that — ain’t nobody got time to cook and peel beets if you don’t need to! Also the recipe calls for pre-cooked farro. Really people, just cook your own, it takes no time at all and is far tastier. Hey, but other than that I followed this recipe exactly! Bring 2/3 cup water and 2/3 cup vinegar to a boil in a small saucepan. Add onion; boil 1 minute. Remove from heat; let stand 15 minutes. Drain. Bring a medium saucepan of water to a boil. Add broccolini, and cook until just crisp-tender, about 2 minutes; drain. Rinse with cold water; drain. Place garlic in a mini food processor; pulse until finely chopped. Add parsley; pulse until chopped. Add remaining 5 Tbsp oil, remaining 1-1/2 tsp vinegar, and 1/2 tsp salt; process until well blended. Heat farro according to package directions. Combine beet wedges, farro, and remaining 1/2 tsp salt. Divide farro mixture and broccolini evenly among 4 plates; top evenly with onion, orange slices, and chicken. Drizzle each serving with about 2 Tbsp parsley sauce; if desired, sprinkle with dill. There is little I look forward to more than being able to curl up on the couch with my favorite evening show (or in my case, Cubs baseball) and eat dinner out of a big ‘ol bowl. More often than not, however; the more comforting and satisfying said Bowl is to eat, the less healthy and virtuous it is to have consumed. Not in this case. Today I present a big bowl of comfort, joy and about the healthiest thing you can eat for dinner. I find myself eating like this more frequently than I have in the past. Rather than a protein, veggie, starch, etc artfully displayed on a plate, I now enjoy throwing a bunch of goodness in a bowl, mixing it up and digging in! Grain Bowls with Chicken, Spiced Chickpeas and Avocado has a bit of everything and keeps you happy and picking away until the very end. The chickpeas and the avocado add perceived luxuriousness without any guilt. Their creaminess is a nice contrast to all the fabulous crunch in this dish and it all of it comes together with a bright herby vinaigrette. The recipe comes from Epicurious and while they gave a choice of grains to use in this dish, my go-to grain of choice is always farro and that’s what was used here. Make the chickpeas – Heat oil in a large skillet over medium heat. Cook chickpeas, cumin and cayenne, shaking to coat, until heated through. Increase heat to medium-high and cook, shaking occasionally, until chickpeas are golden brown and crisp, about 10 minutes. Transfer to paper towels and season immediately with salt. Make the dressing – Meanwhile, pulse parsley and mint in a food processor until finely chopped. Add oil, lemon juice, honey, and salt and pulse to combine. Assemble the bowls – Toss grains (farro in my case) with 1/2 cup dressing in a large bowl. Divide among individual bowls. Toss chicken with 1/4 cup dressing in the same large bowl. 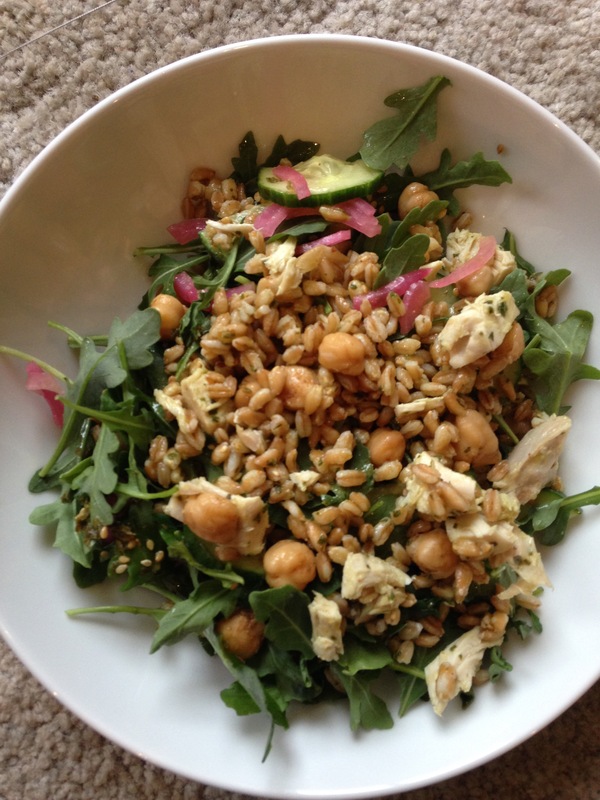 Arrange chicken, cucumbers, avocados and arugula over farro. Top with chickpeas, pickled onions, and sesame seeds. Serve remaining dressing on side for drizzling. It has taken me a while, but I finally think I have figured out the Food God’s evil, master plan. It makes you crave – then gorge on – all of that excessive, sugar-laden, rich, gooey, nostalgic food over the holidays simply so that come New Year’s, you actually crave healthy, clean meals. And it works…..every time. Last night was the first night we either weren’t traveling, entertaining house guests, eating out with friends, or simply trying to clear out the fridge of the holiday dregs that still lingered..tempting us. We needed a clean break, literally and figuratively from all the crap we’d been eating (and loving, I might add). The problem is, after such a gluttonous long week, bland boring “diet food” would not cut it. I wanted something healthy-tasting but with loads of flavor. Something that felt hearty yet wouldn’t weigh me down. 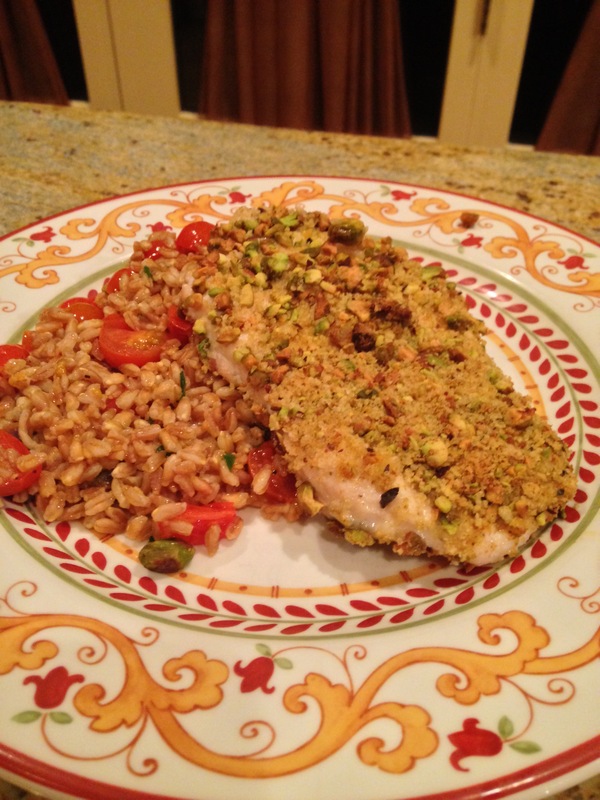 My “dinner in shining armor” arrived in the form of Pistachio-Crusted Chicken with Warm Barley Salad. Since hubby prefers farro to barley (and yes, I take full credit and much pride in that fact! ), I made that swap. The dish is amazing. Perhaps the best testament is that even though its insanely healthy, I’ll gladly make and eat this dish anytime — not just when trying to cut back and clean up my act. The recipe comes from Eating Well and is a wonderful mix of flavors, textures and all-around wholesome yumminess. Preheat oven to 450F. Coat a wire rack with cooking spray and place on a foil-lined baking sheet. Bring 2 cups water and barley or farro to a boil in a small saucepan. Reduce heat and simmer until tender, 10-12 minutes. Set aside. Meanwhile, pulse 3/4 cup pistachios, breadcrumbs, orange zest and garlic powder in a food processor until the pistachios are coarsely chopped. Transfer to a shallow dish. Whisk egg white and the remaining 1 Tbsp water in another shallow dish. Place chicken between 2 pieces of plastic wrap. Pound with the smooth side of a meat mallet to an even 1/2-inch thickness. Sprinkle the chicken with 1/4 tsp salt, coat with the egg mixture and dredge in the pistachio mixture, patting to adhere. Place on the prepared rack. Coat both sides of the chicken with cooking spray. Bake the chicken until and instant-read thermometer inserted in the thickest part registers 165F, about 15 minutes. Heat oil in a large skillet over medium heat. Add tomatoes and vinegar. Cook until the tomatoes just start to collapse, about 1 minute. Remove from heat. Drain barley or farro, if necessary, and stir into the tomatoes along with the remaining 1/4 cup pistachios, 1/4 teaspoon salt and parsley. Serve with the chicken. Can I just say that farro rocks?? I am beginning to realize that I have a serious crush on this grain. While it makes a perfectly fine side dish, I prefer to make it the star and that usually means some sort of grain salad that lets the farro shine. This is that salad. 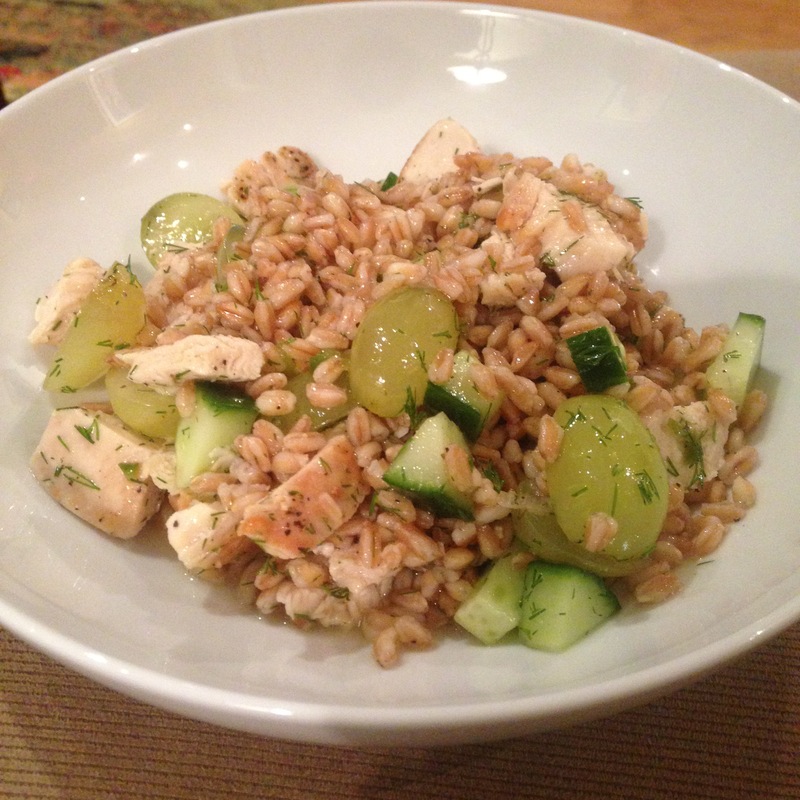 Farro, Chicken and Grape Salad comes from Fine Cooking and it is perfect for this time of year. It can be eaten with the farro and chicken warm for a dinner as we did this week or chilled and taken to work for a hearty lunch. I suspect I’ll be making this a lot in the coming months — for myself and for several of my clients. In a 4-quart saucepan, combine the farro with enough water to cover. Add 1/2 tsp salt and bring to a boil. Reduce to a simmer and cook until the farro is tender but still slightly chewy, 15 to 18 minutes. Drain. Meanwhile, in a large bowl, combine the mirin, lemon juice, sesame oil, jalapeño, 1-1/2 tsp salt and 1/2 tsp pepper. Season the chicken with salt and pepper. In a 12-inch skillet, heat the oil on medium-high heat. Add the chicken and cook, flipping once, until brown on both sides and just cooked through, 8 to 12 minutes total. Let rest for 5 minutes, then cut into 1/2-inch cubes. Add the chicken and any accumulated juice, the farro, grapes cucumber and dill to the vinaigrette. Toss to combine. Season to taste with salt and pepper and serve. Even though it has started to cool off a bit here, I still have those days that I crave a salad. But it needs to be a season-appropriate salad. A bit on the hearty side, with a warm element or two and a recipe that uses the best of fall produce. And, if it has bacon in it…. even better!! My answer is this spectacular salad. 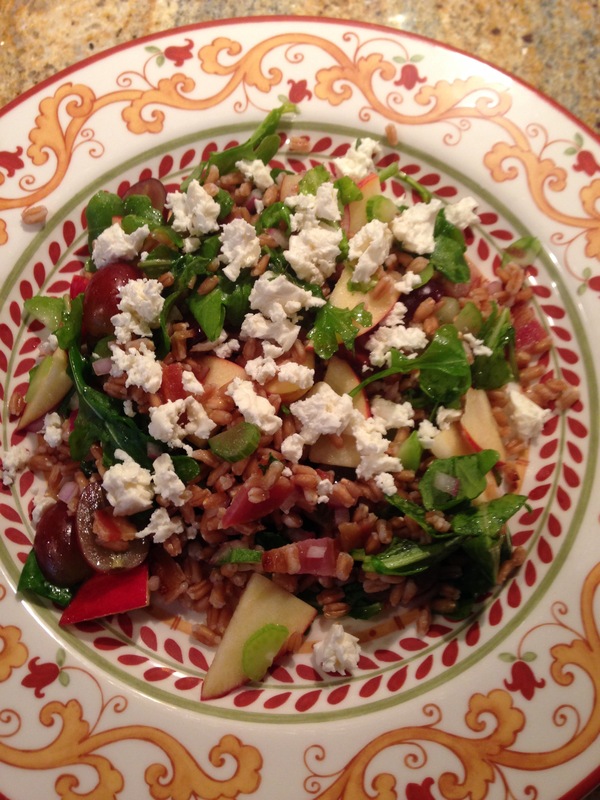 Apple, Farro and Bacon Salad with Warm Feta Cheese comes from Woman’s Day magazine. It’s a salad that definitely stays with you for a while — you won’t be hungry thirty minutes after eating it. Roasting the bacon also makes it a bit chewier than if you simply fried it which, along with the farro, gives you something to sink your teeth into. And besides that … its bacon, so it has that going for it already. Heat oven to 425F. Cook the farro according to package directions. Place the bacon in a single layer on a rimmed baking sheet and roast until crisp, 12-15 minutes; crumble and set aside. Meanwhile, place the feta in the center of a piece of foil. Drizzle with 1 tsp. oil; sprinkle with thyme and pepper. Pull the foil up around the feta to create a pouch. Bake for 5 minutes just before serving. In a large bowl, whisk together the vinegar and 1/2 tsp each salt and pepper. Add the onion and toss to coat; let sit for 5 minutes. Add the celery, grapes and apple and toss to combine. Add the farro, drizzle with the remaining 2 Tbsp. oil and toss to combine. Fold in the arugula and bacon and serve with the feta. This is the type of soup I would usually save for a dinner, possibly even a Sunday Supper. However, within the past three days here in Chicago the daytime temps have hovered around zero and we won’t even discuss the windchill – minus 20 to 30 have been the norm with howling winds. You need something substantial to keep you going through that kind of weather. You need soup. But not some wimpy, pureed, vegetable-based soup. You need meat! Having said all that, it is also January which means my annual attempt to eat healthier and lighter has also kicked in. What a conundrum! How will I satisfy my need for hearty sustenance with my desire for more veggies and healthy stuff? 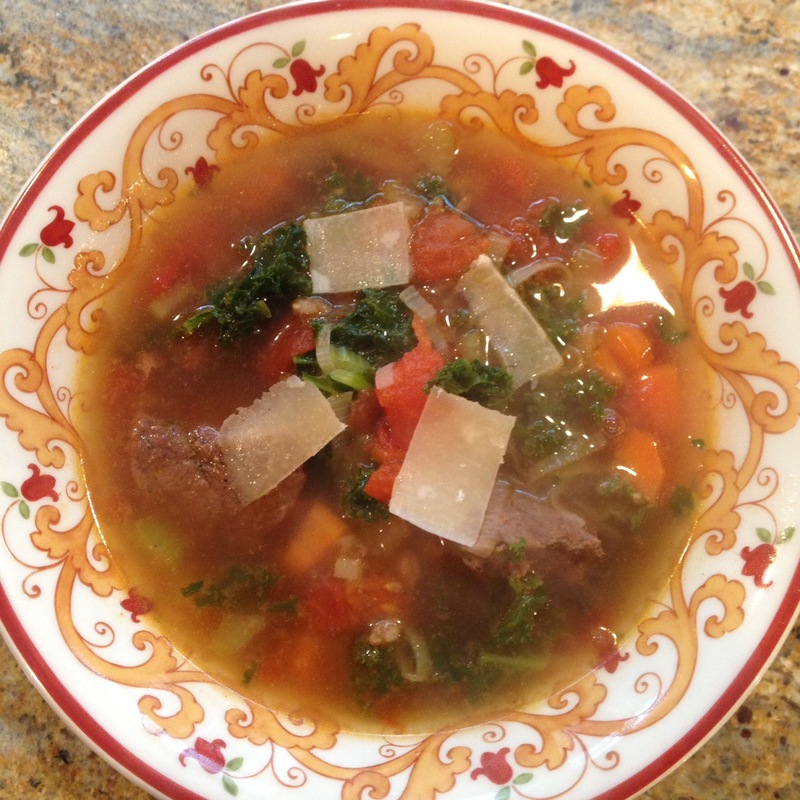 The answer: Beef and Farro Soup. Yes, it has beef. But it also is loaded with carrots, celery, tomatoes, KALE, and my new favorite grain, farro. I got the recipe from a recent issue of Food & Wine and while it does take quite a while to prepare, it is super easy to make. And an added bonus is while you are hunkered down in the house waiting for the temps outside to inch into the double-digits (which I’m still waiting for, by the way), the house smells amazing! In a large enameled cast-iron casserole, heat the oil. Season the meat with salt and pepper. Add half to the casserole and cook over moderate heat, turning, until browned, about 5 minutes. Using a slotted spoon, transfer to a large plate. Repeat with the remaining meat. Pour off all of the oil from the casserole. Add 1 cup of the stock and stir, scraping up any browned bits. Add the remaining 8 cups of stock along with the meat, garlic, thyme and bay leaves and bring to a simmer. Cover and cook over low heat, stirring occasionally, until the meat is tender, about 1-1/2 hours. Stir in the farro and bring to a simmer. Cover and cook over moderate heat until the farro is almost tender, 20 minutes. Stir in the tomatoes, leek, celery, carrots, kale, miso and paprika. Cover and cook until the vegetables are tender, about 10 minutes. Discard the garlic and herb sprigs. Season with salt and pepper. Ladle into bowls. Garnish with cheese and serve.